damages is set by state law. 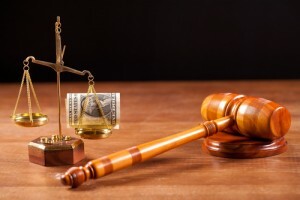 Compensatory damages, which are monetary awards granted to plaintiffs in an effort to help them financially recover from the personal injury that was the subject of the case. As such, compensatory damages typically are intended to help repay plaintiffs for their medical bills, ongoing treatment costs, property damages, lost wages (past and future lost wages if their injuries will prevent them from working for some time in the future), etc.While the expenses associated with such bills and out-of-pocket costs can be calculated based on any bills that the plaintiff has received to date, calculating the costs associated with mental anguish can be a little “softer” in that judges and juries generally will look to other similar cases or will make estimations for this element of the compensation (as there are usually no concrete bills associated with mental suffering). Punitive damages, which may also be referred to as exemplary damages and are levied against defendants in an effort to punish them for their negligent and reckless behavior. The point of ordering defendants to pay punitive damages is to attempt to deter them and other similar defendants from behaving in such a negligent manner in the future.For example, if an insurer in a bad faith lawsuit is found to have been negligent and is ordered to pay punitive damages, the court will be trying to make an example out of the specific insurer for other insurance companies (to deter all such companies from acting in bad faith in the future).Each state in the U.S. has its own laws regarding punitive damages – specifically when they can be applied, the maximum amount of punitive damages that can be awarded and whether there can be separate trials for this type of personal injury settlement. Be sure to check out our upcoming second and third parts of this blog for a more in-depth discussion regarding the specific Missouri and Illinois laws regarding punitive damages for personal injury cases. If you have sustained any type of personal injury and believe that another person’s or party’s negligence may have caused the injury, contact the St. Louis personal injury lawyers at Brown & Brown Attorneys at Law. We have a long-standing commitment to serving our clients, and we are experienced at aggressively defending our clients’ rights in any legal setting. Our goal is to preserve and promote the rights and welfare of individuals and families who have suffered injuries and losses and/or who need help navigating the complexities of the court system. Since 1993, our lawyers have been successfully representing our clients in various areas of personal injury litigation, including motor vehicle accident lawsuits, insurance bad faith cases, dangerous drug lawsuits and catastrophic injury cases. Our unwavering dedication to the pursuit of justice in every case we handle means that we will work relentlessly to help our clients achieve the best possible outcomes to their cases. One of our primary goals is to help accident victims secure the maximum possible compensation for their injuries and losses so they can focus on their recovery and moving on with their lives. For a free initial consult, email us using the form at the right-hand side of the screen and/or to call us at 573-333-3333 for our Missouri office or at 618-888-8888 for our Illinois office.